Of Arabic origins, this sweet, made essentially with an almond base and honey, turron is an indisputably an important item on any Christmas table. 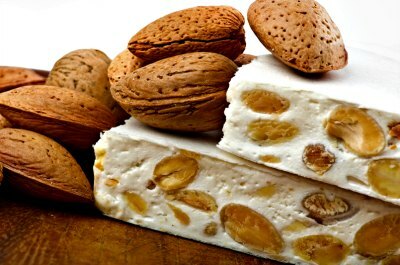 Turron from Alicante is a nougat obtained by cooking honey and adding toasted almonds (usually peeled) and egg whites and kneading it to form a rectangular or round tablet. It is characteristically hard and it is known especially for the presence of whole or nearly whole peeled almonds. Despite the obvious industrialisation of its production, the process is still basically the same as it traditionally has been for centuries. Crunchy Alicante Almond Turron Candy by 1880:Classic Turrón Alicante is an incomparable almond treat. The famous producer '1880' makes these crunchy almond turrón bars by bonding premium whole Marcona almonds with local orange blossom honey following a centuries' old artisinal recipe. This fine turrón is made by the famous producer '1880' whose products are recognized throughout Spain as the finest. They continue to be made in Jijona, Alicante - for centuries, the center of turrón production in Spain. Turrón has its origins in the Moorish times, when almonds and honey were a prized treat. Over the centuries it became a favorite Christmas candy across Spain. Each package contains two bars of crisp turrón, foil-sealed for absolute freshness. Crunchy Alicante Torta Turrón Candy by 1880:Classic Turrón Alicante is an incomparable almond brittle. Marcona almonds make up 65% of these 'suprema' gourmet rounds-- one cannot add many more almonds before it would crumble! Sugar Free Crunchy Alicante Turron Candy by 1880:Turron Alicante almond brittle is Spain's most popular, and now you can enjoy the sugar free version! Made from gourmet Marcona almonds from southern Spain, there is no higher quality turron candy in the world. '1880' is the most famous turron producer in Spain, a synonym for quality. For 10 generations this family company has maintained the quality of this traditional candy, while adapting to modern tastes. This sugar-free turron has the sweet flavor and crunch that has made this kind of candy a favorite for generations. It just doesn't have the sugar or honey that you may wish to avoid! Enjoy with coffee or tea. Also great as a nutritious snack for the road or trail.